A Rare Recording of Knute Rockne - Audiobook (other) | Listen Instantly! Knute Rockne (1888–1931) was an American football player and coach, both at the University of Notre Dame. He is regarded as one of the greatest coaches in college football history. Rockne popularized the forward pass and made Notre Dame a major factor in collegiate football. This recording is a famous pregame locker room pep talk he gave to his players. 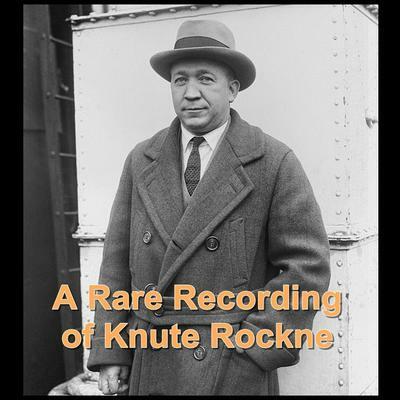 Knute Rockne (1888–1931) was born in Voss, Norway. He immigrated with his family to Chicago in 1893. He ran track and played end on the University of Notre Dame football team. Rockne popularized the forward pass as a major offensive tactic. In 1919 he was named head coach at Notre Dame. In his thirteen seasons, his “Fighting Irish” posted an impressive record (105–12–5) that included five undefeated seasons and three national championships.